An Ariane 5 rocket, launching for the seventh time this year, lifted off from French Guiana on Wednesday with a secure communications satellite for the British armed forces and an all-purpose broadcasting platform for the Mexican government. The heavy-lifting launcher blasted off at 2149 GMT (4:49 p.m. EST) from the ELA-3 launch zone at the Guiana Space Center, a European-run spaceport in French Guiana at the edge of the Amazon jungle. Launch occurred at 6:49 p.m. local time. After lighting its hydrogen-fueled Vulcain core engine and passing a computerized health check, the Ariane 5 ignited its twin solid rocket boosters and quickly ascended from the French Guiana spaceport. The launcher pitched east from the space center, soaring through scattered clouds but remaining in view of ground tracking cameras for several minutes. The two strap-on boosters, each measuring 101 feet long, consumed their propellant in less than 150 seconds. The Ariane 5's main stage released the spent motor casings and continued firing as the rocket crossed the Atlantic Ocean. The main stage's Vulcain engine powered the flight for 9 minutes, then the Ariane 5's upper stage fired for nearly 16 minutes to place the mission's payloads in a oval-shaped transfer orbit reaching more than 22,300 miles from Earth at its highest point. The Skynet 5D satellite, a jam-resistant spacecraft built to serve the British Ministry of Defence, deployed from the rocket 27 minutes after liftoff. The Mexsat Bicentenario satellite separated from the Ariane 5's upper stage a few minutes later. Arianespace, the Ariane 5's commercial operator, declared the mission a success. It marked the Ariane 5's 53rd consecutive successful launch since 2003. The flight was also the 10th space launch from the Guiana Space Center this year, the most activity at the launch site since 2002. 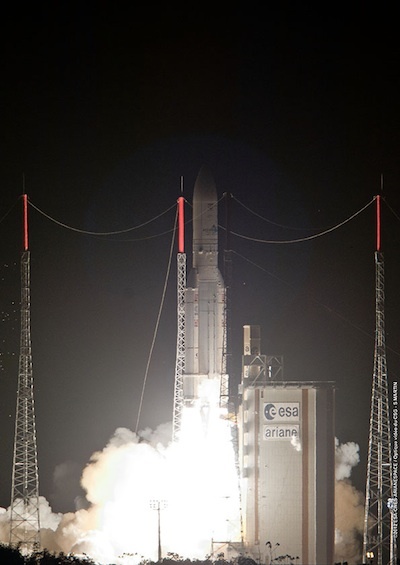 The launches included seven Ariane 5 flights, two missions using the Russian Soyuz rocket, and the first launch of Europe's new lightweight Vega booster. "This rate confirms the interest, efficiency, and availability of our range of launch vehicles, enabling us to launch any satellite, for any customer, into any orbit," said Jean-Yves Le Gall, chairman and CEO of Arianespace. The 10,680-pound Skynet 5D satellite will be stationed over the Middle East, beaming communications to British ground troops, ships and airplanes. Skynet 5D will climb to a circular orbit 22,300 miles over the equator, where it will enter service in geostationary orbit at 53 degrees east longitude. Skynet 5D will reinforce existing capacity and become the most widely-used satellite in the Skynet fleet, according to Astrium, which built and will operate the satellite for the UK Ministry of Defence. Astrium Satellites manufactured Skynet 5D, and another division of the company - Astrium Services - operates the Skynet satellite system. The Skynet 5 program includes four satellites, and Astrium's contract with the British military runs through 2022 for an estimated value of more than $6 billion. Like other satellites in the Skynet fleet, Skynet 5D will offer secure, high-speed voice and data communications to British troops and allied forces, including the U.S., Portuguese and Australian armed forces. Skynet satellites provide all beyond line-of-sight communications to the UK Ministry of Defence and the Cabinet Office, according to Astrium. The system's satellites carry X-band and UHF communications payloads. "These are military-grade satellites that provide real robust communications which are pretty much [impervious] to the majority of known cyber threats," said British Army Col. Justin Hodges, deputy head of beyond line-of-sight communications for the UK Ministry of Defence. Designed to work for more than 15 years, Skynet 5D features larger fuel tanks, enabling operators to more efficiently reposition the satellite to respond to changing needs, according to Astrium. Mexsat Bicentenario, a 6,469-pound satellite built by Orbital Sciences Corp., was the Ariane 5 rocket's other passenger. The spacecraft was manufactured by Orbital under contract to Boeing Co., which is developing a three-satellite system and ground network for the Mexican government. Mexsat Bicentenario, also named Mexsat 3, will provide fixed communications services with 12 active C-band and 12 active Ku-band transponders. From its operating post at 114.9 degrees west longitude, the satellite's communications payload will reach users across Mexico and surrounding waters. Boeing is building two larger satellites tailored for mobile communications services. The Mexsat system is expected to be in service until 2028. Mexsat Bicentenario is based on Orbital's GEOStar 2 satellite bus. It will enter service in 2013, beaming broadband Internet, telephone, telemedicine, education and videoconferencing across Mexico. It will also reach rural communities not served by existing infrastructure. Mexsat Bicentenario will enter service by the end of January 2013, officials said. The Mexsat system will aid Mexican government officials in disaster response and national security applications, according to the Mexican Ministry of Communications and Transportation. Gerardo Ruiz Ezparza, Mexico's Secretary of Communications and Transportation, called the Mexsat program "the most important satellite project in the history of Mexico."